Have you ever noticed how lighting can affect your mood? Does the natural light make you feel energised? Do you feel sleepy when the lighting is dim? Does harsh hospital lighting make you feel uneasy or romantic candlelight make you relax? The reason for this effect is the colour temperature of the lighting. Light therapy studies have found that different light colours affect moods, heart rates and circadian rhythms. Different intensities of light cause the body to release different hormones. A high colour temperature triggers the release of Serotonin which effects our mood and energy levels. This is referred to as blue light or a cool temperature and occurs naturally from the sun during the day. If you want to increase productivity and promote a positive environment, short blue wavelengths are the best. A low colour temperature triggers the production and release of Melatonin which causes us to unwind, relax then become sleepy. Low colour temperature is often referred to as warm, red light and occurs naturally at the end of the day. By using the right light colours at the right time of day, you’ll boost your body’s ability to remain alert and active when it’s appropriate, and wind down and relax when necessary. For this reason, lighting is a vital component of the design process. By understanding the health effects of different light colours, you can design a space that promotes positivity and wellbeing. Countless studies have shown that when the colour temperature is considered for the required activity in a home, workspace or public building the outcome is very positive. It can increase productivity, improve learning, energise people or relax them. Until recently, the introduction of fluorescent and LED lighting had meant a restriction in light colour with only high colour temperature lighting available in this form. In the last few years however advancements in this technology have been made. LED lighting is now available in a whole range of colour temperatures. Colour temperature is measured in Kelvin (K), with 1000K being at the bottom of the scale and 8000k at the top. Candle light sits at around 2000k and CFL and Fluorescent lights reach up to 7500k. It is a common misconception that colour temperature relates to wattage. The wattage however only relates to the consumption value. The shift to LED lightings now means a lights performance is measured by combining the two aspects of brightness, (Lumens) and light colour (Kelvin). 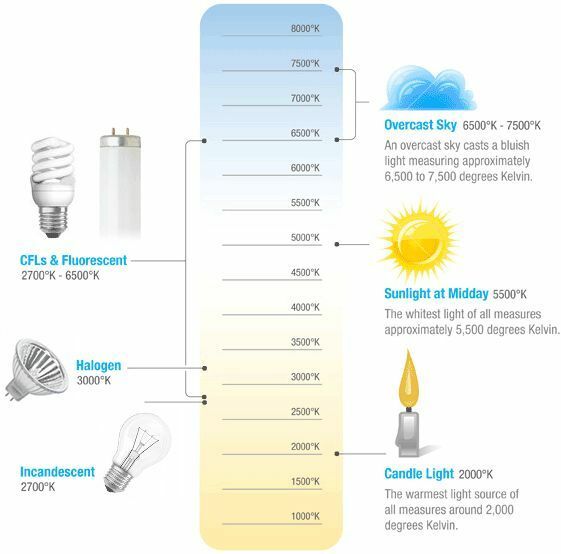 At Edison we specialise in ambient lighting so have a large portion of our lighting in the low (warm) temperature range. This type of color temperature is best suited to dining rooms and bars where a more relaxed mood is required. We offer you the option to shop our light globes by colour temperature. The warmest bulbs we produce are vintage incandescent style at 1800K. These type have become very popular with bars and restaurants due to the calming mood they create. The warmest LED bulbs we produce are 2200K suitable where replacing vintage incandescent where higher efficiency and longer life is desirable. These bulbs are the most commonly used in our lighting styles due to their color temperature and the ability to show the bulb in the light fitting without dazzle. These are most often made as dimmable so that output can be controlled. For higher brightness we often produce 2700K LED, still warm but not a vintage color temp. Click on the image to see all bulbs available at the described color temp or use or “Globe Selector” at the bottom left of the website.